The first trial casting of my new metal typeface, Baker, has arrived from Swamp Press & Letterfoundry, where the matrices were engraved by Ed Rayher. After proofing the type, I am revising the short T, the S, and the Z, but we are nearly there. We now expect the type to be complete and ready to ship in July. A close-up of the first casting of Baker. 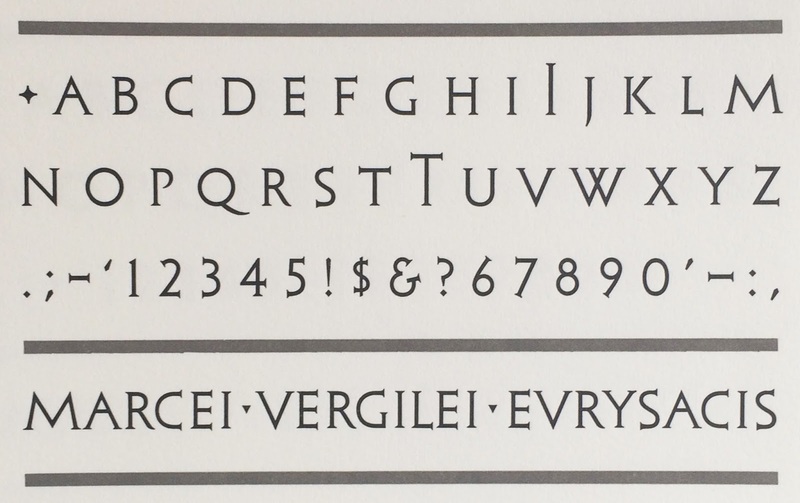 The type design is based on the late Republican inscription on the tomb of M. Vergilius Eurysaces, a contract baker in the first century BCE. 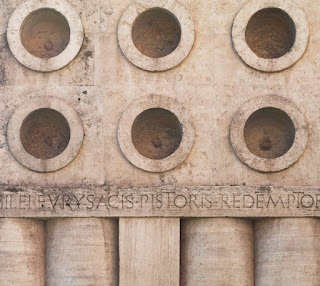 The tomb is located just outside the Porta Maggiore in Rome. Its facade is notable as "a pure experiment in geometrical forms*," an experiment that is carried through to its letterforms. Few classical monuments are so modern in their design or so fully integrated in the design of their architecture and their lettering. The tomb appears to straddle millenia, or to exist outside of time altogether, a quality that is accentuated by its proximity to the comparatively fussy and rusticated Porta Maggiore. A detail of the Baker's tomb, showing the geometrical facade and a section of the inscription. Baker is a 24pt type. It consists of the twenty-six majuscules, a tall T and tall I (both cast on a 30pt body), the ten figures, period, comma, semi-colon, colon, exclamation, question, hyphen, en dash, single open quote, single closed quote/apostrophe, ampersand, dollar sign, and three center dots: a triangle-esque, a diamond, and a shadow circle (not pictured in the image below). The A, R, T, V, W, Y will all come in kerning and non-kerning characters. 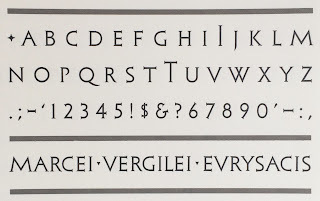 The fonts will be standard 16 A half-jobbing fonts, but the figures will be reduced by a quarter because no one really needs that many figures and it will allow for the alternate kerning characters. If you are interested in purchasing a font, email me at russellmaret (at) me.com. A proof of the first casting of Baker. The short T, S, and Z will be revised. *L. Richardson A New Topographical Dictionary of Ancient Rome (1992) 355. Photo of Eurysaces' tomb by Annie Schlechter.